Claire McCardell was born May 24, 1905, in Frederick, Maryland. She showed an aptitude and passion for fashion from a young age, and began making her own clothes during her early adolescence. At age 18 McCardell enrolled in Hood College in Fredrick, Maryland, but she left after two years to pursue fashion illustration at the New York School of Fine and Applied Art (known today as Parsons School of Design). In 1927 McCardell transferred to the Parsons branch in Paris at the Place des Vosges. There, she gained hands-on experience with Paris couture and perfected her understanding of garment construction. When she returned to New York she worked as a model, a seamstress and as a designer for a small knit-goods company. In 1929 McCardell began working as an assistant designer for Robert Turke, and moved with him to Townley Frocks, Inc. when Turk’s own firm disbanded. A month before the spring showing in 1931, Turk tragically drowned and McCardell was left responsible for completing the collection. She copied the latest styles from Paris and the collection sold well, although it was moderately received. For the following collection she experimented with shapes and materials in a more avant-garde style, but these were too advanced for the mainstream market, which was not yet ready for her revolution of casual clothing and sportswear. Then, in 1938 McCardell launched her famous 'Monastic Dress', a shapeless bias-cut dress that was worn with a belt to cinch the waist. It was extremely successful and widely copied by mass retailers. McCardell left Townley Frocks for a brief time and went to Hattie Carnegie (1938-1940), where she worked alongside Norman Norell. She later returned to Townley Frocks, where she spent the rest of her career. While other designers struggled during World War II without the guidance of French designers and with the unavailability of traditional fabrics and materials, McCardell took advantage of the circumstances. She used nontraditional fabrics such as denim and wool jersey, while continuing to design clothing to meet the everyday needs of the American woman. In 1942 she designed the 'Pop-over' dress, a wrap dress that was meant to be popped-over pants, bathing suit or the bare skin. It was simple, comfortable and functional- a style that became McCardell's signature. 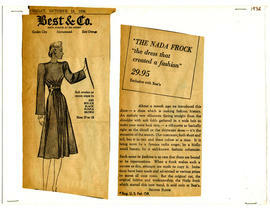 The dress was very successful and was incorporated in different variations into every collection from then on. During her short career McCardell collaborated with many retailers and manufacturers and received several awards and accolades for her innovative fashion. Among them were the Mademoiselle Merit Award, Coty American Fashion Critics Award, Nieman-Marcus Award, and Women's National Press Club Award. McCardell's contributions to the fashion industry include metal closures, blue-jean stitching, mix and match separates, and the influence of menswear in women's designs. Perhaps most importantly, she helped create an “American Look” that was distinct from traditional Parisian fashion. Sadly, McCardell succumbed to cancer on March 22, 1958, at age 52. See the Accession Folder for more information. Gift of Mr. Adrian McCardell, September 1981. The collection includes Claire McCardell's sketches and illustrations as a student, as well as sketches, newspaper and magazines clippings, correspondence, advertisements, invitations to fashion-related events and original photographs from her career as a fashion designer. Access is open to researchers by appointment at the Fashion Institute of Technology Library, Department of Special Collections and College Archives. If you have any questions, or wish to schedule an appointment contact us at fitlibsparc@fitnyc.edu or call (212) 217-4385. The Department of Special Collections and FIT Archives does not own copyright for all material held in its physical custody. It is the researcher's obligation to abide by and satisfy copyright law (http://www.copyright.gov/title17/92chap1.html#108) when copying or using materials (including digital materials) found in or made available from the department. When possible, the department will inform a researcher about the copyright status of material, the researcher's obligations with regard to such material, and, wherever possible, the owner or owners of the copyrights. Any and all reproduction of originals is at the archivist's discretion. Arrangement, description, and/or archival processing by Keren Ben-Horin, FIT, NY, NY, USA.